Lupita Nyong'o plays the role of Adelaide Wilson / Tethered Adelaide in Us. Lupita Amondi Nyong'o (Kenyan English: [luˈpiːtɑː ˈɲɔːŋɔ]; born March 1, 1983) is a Kenyan-Mexican actress. The daughter of Kenyan politician Peter Anyang' Nyong'o, she was born in Mexico City and raised in Kenya. She attended college in the United States, earning a bachelor's degree in film and theater studies from Hampshire College. Nyong'o began her career in Hollywood as a production assistant. 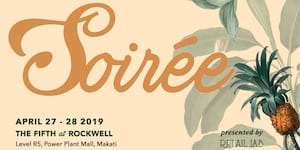 In 2008, she made her acting debut with the short film East River and subsequently returned to Kenya to star in the television series Shuga (2009). Also in 2009, she wrote, produced and directed the documentary In My Genes. She then pursued a master's degree in acting from the Yale School of Drama. Soon after her graduation, she had her first feature film role as Patsey in Steve McQueen's historical drama 12 Years a Slave (2013), for which she won the Academy Award for Best Supporting Actress. She became the first Kenyan and first Mexican actress to win an Academy Award. Nyong'o made her Broadway debut as a teenage orphan in the critically acclaimed play Eclipsed (2015), for which she was nominated for a Tony Award for Best Actress in a Play. 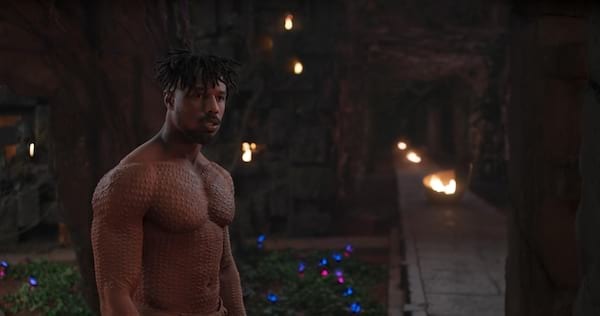 Following a motion capture role in the Star Wars sequel trilogy, Nyong'o starred as Nakia in the superhero film Black Panther (2018). Nyong'o was born in Mexico City, Mexico, to Kenyan parents, Dorothy Ogada Buyu and Peter Anyang' Nyong'o, a college professor turned politician. Nyong'o identifies as Kenyan-Mexican and has dual Kenyan and Mexican citizenship. She is of Luo descent on both sides of her family, and she is the second of six children. It is a tradition of the Luo people to name a child after the events of the day, so her parents gave her a Spanish name, Lupita (a diminutive of Guadalupe). Her father is a former Minister for Medical Services in the Kenyan government. At the time of her birth, he was a visiting lecturer in political science at El Colegio de México in Mexico City, and her family had been living in Mexico for three years. Nyong'o and her family moved back to their native Kenya when she was less than one year old, as her father was appointed a professor at the University of Nairobi. She grew up primarily in Kenya, and describes her upbringing as "middle class, suburban". When she was sixteen, her parents sent her to Mexico for seven months to learn Spanish. During those seven months, Nyong'o lived in Taxco, Guerrero, and took classes at the Universidad Nacional Autónoma de México's Learning Center for Foreigners. Her family was later forced to leave Kenya because of political unrest. Her uncle, Charles Nyong'o, disappeared after he was thrown off a ferry in 1980. Nyong'o grew up in an artistic family, where get-togethers often included performances by the children, and trips to see plays. She attended Rusinga International school in Kenya and acted in school plays. At age 14, Nyong'o made her professional acting debut as Juliet in Romeo and Juliet in a production by the Nairobi-based repertory company Phoenix Players. While a member of the Phoenix Players, Nyong'o also performed in the plays On The Razzle and There Goes The Bride. Nyong'o cites the performances of American actresses Whoopi Goldberg and Oprah Winfrey in The Color Purple with inspiring her to pursue a professional acting career. Nyong'o later attended St. Mary's School in Nairobi, where she received an IB Diploma in 2001 before attending college in the United States. She graduated from Hampshire College with a degree in film and theatre studies. Nyong'o started her career working as part of the production crew for several films, including Fernando Meirelles's The Constant Gardener (2005), Mira Nair's The Namesake (2006) and Salvatore Stabile's Where God Left His Shoes (2007). She cites Ralph Fiennes, the star of The Constant Gardener, as someone who inspired her to pursue a professional acting career. In 2008, Nyong'o starred in the short film "East River", directed by Marc Grey and shot in Brooklyn. She returned to Kenya that same year and appeared in the Kenyan television series Shuga, an MTV Base Africa/UNICEF drama about HIV/AIDS prevention. In 2009, she wrote, directed, and produced the documentary In My Genes, about the discriminatory treatment of Kenya's albino population. It played at several film festivals and won first prize at the 2008 Five College Film Festival. Nyong'o also directed the music video The Little Things You Do by Wahu, featuring Bobi Wine, which was nominated for the Best Video Award at the MTV Africa Music Awards 2009. Nyong'o went on to enroll herself in a master's degree program in acting at the Yale School of Drama. At Yale, she appeared in many stage productions, including Gertrude Stein's Doctor Faustus Lights the Lights, Chekhov's Uncle Vanya, and William Shakespeare's The Taming of the Shrew and The Winter's Tale. While at Yale, she won the Herschel Williams Prize for "acting students with outstanding ability" during the 2011–12 academic year. Immediately after graduating from Yale, Nyong'o landed her breakthrough role when she was cast for Steve McQueen's historical drama 12 Years a Slave (2013). The film, which met with wide critical acclaim, tells the historical account of Solomon Northup (played by Chiwetel Ejiofor), a free-born African American man of upstate New York who is kidnapped and sold into slavery in Washington, DC in 1841. Nyong'o played the role of Patsey, a slave who works alongside Northup at a Louisiana cotton plantation; her performance met with rave reviews. Ian Freer of Empire wrote that she "gives one of the most committed big-screen debuts imaginable," and critic Peter Travers added that she "is a spectacular young actress who imbues Patsey with grit and radiant grace". Nyong'o was nominated for several awards including a Golden Globe Award for Best Supporting Actress, a BAFTA Award for Best Actress in a Supporting Role and two Screen Actors Guild Awards including Best Supporting Actress, which she won. She was also awarded the Academy Award for Best Supporting Actress, becoming the sixth black actress to win the award, the first African actress to win the award, the first Kenyan actress to win an Oscar, and the first Mexican to win the award. She also became the fifteenth actress to win an Oscar for a debut performance in a feature film. Following a supporting role in the action-thriller Non-Stop (2014), Nyong'o co-starred in Star Wars: The Force Awakens (2015) as force-sensitive space pirate Maz Kanata, a CGI character created using motion capture technology. 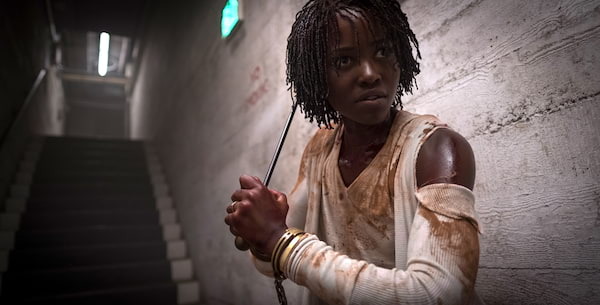 Nyong'o said that she had wanted to play a role where her appearance was not relevant, and that the acting provided a different challenge from her role as Patsey. Scott Mendelson of Forbes, found Nyong'o's role as "the center of the film's best sequence," and Stephanie Zacharek of Time called her a "delightful minor character". Nyong'o was nominated for the Best Supporting Actress at the 42nd Saturn Awards and Best Virtual Performance at the 2016 MTV Movie Awards for her role. The year 2015 saw Nyong’o make a return to stage with a starring role as an unnamed girl in the play Eclipsed, written by Danai Gurira. The play takes place during the chaos of the Second Liberian Civil War, where the captive wives of a rebel officer band together to form a community, until the balance of their lives are upset by the arrival of a new girl (played by Nyong'o). Eclipsed became The Public Theater's fastest-selling new production in recent history. The play premiered on Broadway at the John Golden Theatre the following year. The production became the first play with an all-black and female creative cast and crew to premiere at Broadway. Nyong'o said that she understudied the play at Yale in 2009 and was terrified to play the character on stage. Her performance met with critical acclaim. The New York Times' critic Charles Isherwood called Nyong'o "one of the most radiant young actors to be seen on Broadway in recent seasons, shines with a compassion that makes us see beyond the suffering to the indomitable humanity of its characters." Nyong'o's performance in Eclipsed earned her a Theatre World Award for Outstanding Broadway or Off-Broadway Debut Performance, an Obie Award for a Distinguished Performance by an Ensemble, and a nomination for the Tony Award for Best Actress in a Play. In addition, she was nominated for Outstanding Actress in a Play at the Outer Critics Circle Award and a Distinguished Performance Award at the Drama League Award. Nyong'o revealed in her Lenny Letter that she turned down Hollywood films in order to bring Eclipsed to life on Broadway. 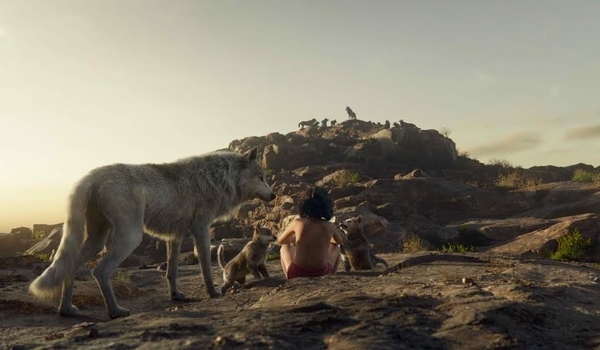 Nyong'o co-starred in Jon Favreau's The Jungle Book (2016), a live-action/animated movie, voicing Raksha, a mother wolf who adopts Mowgli (played by Neel Sethi). Robbie Collin of The Daily Telegraph wrote in his review that Nyong'o brought a "gentle dignity" to her role. 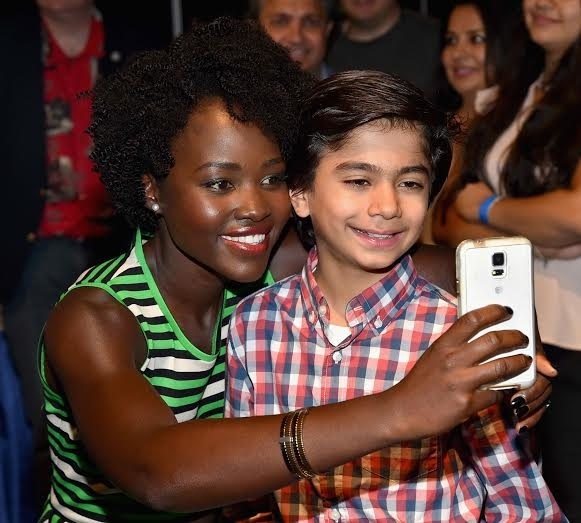 She later co-starred in Mira Nair's Queen of Katwe (2016), a biopic based on the true story about the rise of a young Ugandan chess prodigy, Phiona Mutesi (played by Madina Nalwanga), who becomes a Woman Candidate Master after her performances at World Chess Olympiads. Nyong’o played Phiona's protective mother, Nakku Harriet. Brian Tallerico of RogerEbert.com said, "Nyong’o is phenomenal. She has an incredible ability to convey backstory." 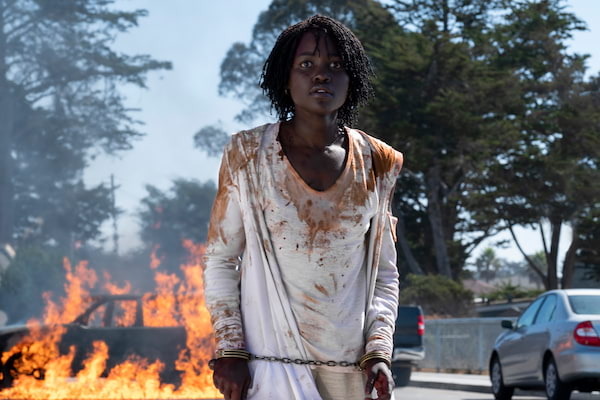 Geoff Berkshire of Variety called Nyong'o s performance "Simply radiant in her first live action role since winning an Oscar for 12 Years a Slave. "She imbues what could have been a stock mother figure with such inner fire that Harriet feels worthy of a movie all her own." Nyong'o reprised her role as space pirate Maz Kanata in Rian Johnson's Star Wars: The Last Jedi (2017). 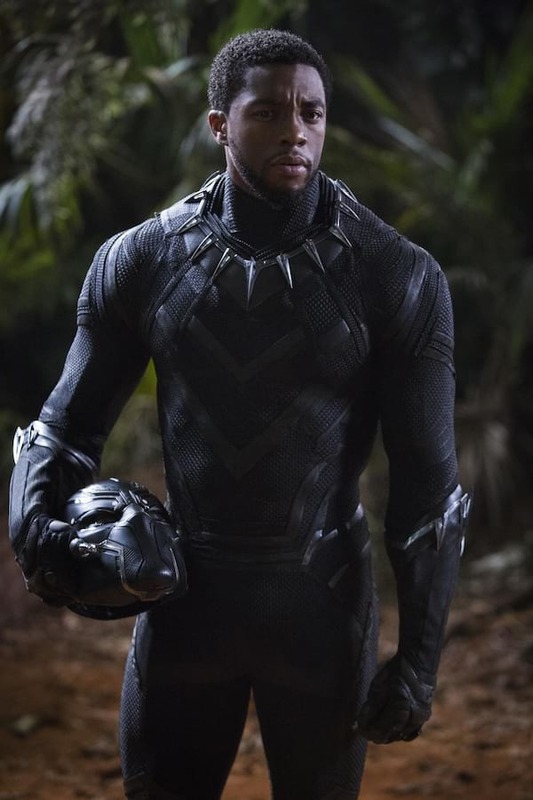 The following year, she starred as Nakia, a member of Dora Milaje, a team of women who serve as special forces of Wakanda and personal bodyguards of T'Challa/Black Panther (played by Chadwick Boseman) in Ryan Coogler's Black Panther (2018). Her character was revealed at the 2016 San Diego Comic-Con. She will also star as teacher Miss Caroline in Abe Forsythe's upcoming Australian zombie romantic-comedy, horror film crossover, entitled Little Monsters. Nyong'o revealed in New York Times that she's working with Simon & Schuster Books for Young Readers to publish a children's book entitled, Sulwe (2019). Sulwe (Luo for star) is the story of a five year old Kenyan girl, who has the darkest complexion in her family. Nyong'o used her experiences as a child to establish the processes for her book. Nyong'o resides in Brooklyn, New York. She is fluent in Spanish, Luo, English, and Swahili. On February 27, 2014, at the Essence Black Women In Hollywood luncheon in Beverly Hills, she gave a speech on the beauty of black women and talked about the insecurities she had as a teenager. She said her views changed when she saw South Sudanese supermodel Alek Wek become successful. In 2013, her father was elected to represent Kisumu County in the Kenyan Senate and by 2017, he became Governor. Nyong'o's mother is the managing director of the Africa Cancer Foundation and her own communications company. Other family members include: Tavia Nyong'o, a scholar and professor at New York University; Dr. Omondi Nyong'o, a pediatric ophthalmologist in Palo Alto, CA; Kwame Nyong'o, one of Kenya's leading animators and leading technology expert; Isis Nyong'o, a media and technology leader who was named one of Africa's most powerful young women by Forbes magazine. In 2014, the National Trust for Historic Preservation recruited Nyong'o in an effort to oppose development, including a new minor league baseball stadium, in the Shockoe Bottom area of Richmond, Virginia. The historic neighborhood, one of Richmond's oldest, was the site of major slave-trading before the American Civil War. On October 19, 2014, Nyong'o sent a letter to Richmond Mayor Dwight C. Jones, which she posted on social media sites, asking him to withdraw support for the development proposal. Nyong'o is involved in the organization Mother Health International, which is dedicated to providing relief to women and children in Uganda by creating locally engaged birthing centers. She said she’d never thought much about birthing practices until her sister introduced her to MHI executive director Rachel Zaslow. Nyong'o felt bringing attention to such important but overlooked issues is a mandate for her as an artist. She was honored for her work at 2016 Variety's Power of Women. In April 2016, Nyong'o launched an anti-poaching "hearts and minds" campaign with her organization Wildaid in advance of Kenya Wildlife Service's history-making ivory burn that occurred April 30. The Kenyan government burned 105 tonnes of Ivory and 1.35 tonnes of rhino horn in a demonstration of their zero tolerance approach to poachers and smugglers who were threatening the survival of elephants and rhinoceros in the wild. In October 2017, Nyong'o wrote an op-ed with New York Times revealing that Hollywood producer Harvey Weinstein sexually harassed her twice in 2011, while she was still a student at Yale School of Drama. She claimed that Weinstein led her to his bedroom and announced that he wanted to give her a complete body massage, which she declined and, panicked, offered him one. Nyong'o also claimed that Weinstein wanted to take off his pants, when she rejected his advances and left the room terrified. Another encounter took place in New York, where she met with Weinstein for dinner after a screening. She quoted Weinstein: "Let’s cut to the chase. 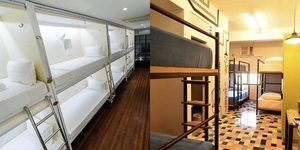 I have a private room upstairs where we can have the rest of our meal." She again declined and left the restaurant. She vowed that she would never work with Weinstein, hence her declining a role in Southpaw (2015). 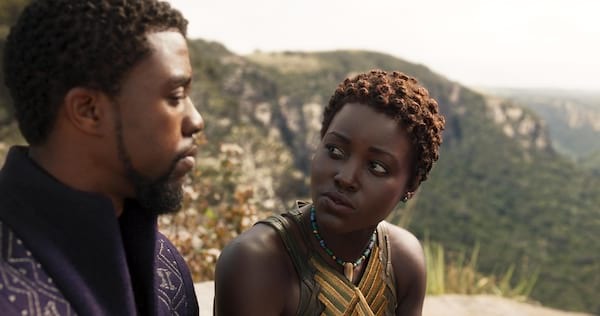 Nyong'o mentioned that she hasn't had any more encounters during her time in Hollywood and would rather work with women directors or male feminist directors, who have not abused their power. Nyong'o was mentioned in Christian rapper Lecrae's song "Nuthin'" from his 2014 album Anomaly and was referenced by Jay Z in his verse from Jay Electronica's song "We Made It". She was also mentioned in the parody song "American Apparel Ad Girls" by the drag queens Willam Belli, Courtney Act and Alaska Thunderfuck. Nyong'o was mentioned in the 2015 African song Nerea by Kenyan afro-pop band Sauti Sol. Rapper Nicki Minaj mentioned Lupita in her verse on A$AP Ferg's remix of "Plain Jane" and was referenced by rapper Wale in his song, "Black is Gold". Nyong'o was included in Derek Blasberg's 2013 best dressed list in Harper's Bazaar. In 2014, she was chosen as one of the faces for Miu Miu's spring campaign, with Elizabeth Olsen, Elle Fanning and Bella Heathcote. She has also appeared on the covers of several magazines, including New York's spring fashion issue and the UK magazine Dazed & Confused. In April of that year, she was named "The Most Beautiful Woman" by People. and was named the new face of Lancôme, making her the first black woman to appear on the brand. Later that November, she was named "Woman of the Year" by Glamour. Nyong'o was on the July 2014 cover of Vogue, making her the second African woman and ninth black woman to cover the magazine. That same month she also appeared on the cover of July's issue of Elle (France). She appeared on the October 2015 issue of American Vogue, making it her second cover in a row. That month, Congressman Charles Rangel and Voza Rivers, the head of the New Heritage Theatre Group, announced the day is officially "Lupita Nyong'o Day" in Harlem, New York. The honor was announced as a surprise during an open discussion between Nyong'o and image activist Michaela Angela Davis at Mist Harlem. Nyong'o was included in Annie Leibovitz's 2016 Vanity Fair's Hollywood Issue. Nyong'o was honored with a caricature portrait in May 2016 at Sardi's restaurant in New York City for her debut on Broadway. That July, she was chosen as one of the first celebrities, alongside with Elle Fanning, Christy Turlington Burns, and Natalie Westling to star in Tiffany & Co.'s Fall 2016 campaign styled by Grace Coddington. Nyong'o appeared on Vogue's October 2016 cover, making it her third issue. That month, she was an honoree at the 2016 Elle Women in Hollywood Awards. In January 2017, she appeared on the cover of Vanity Fair's Hollywood Issue. She later appeared on the cover of UK's The Sunday Times Magazine for their October '17 issue. On November 2017, she appeared on the cover of Grazia UK magazine. She later expressed her disappointment with the cover on social media for altering her hair to fit European standards of what hair should looks like. Photographer An Le later apologized in a statement, saying it was "an incredibly monumental mistake". In December 2017, Nyong'o landed her fourth Vogue cover in a row for the January '18 issue, making her the first black actress to do so. She was also included in Tim Walker's 2018 Alice's Adventures in Wonderland - themed Pirelli Calendar as character The Dormouse. On January 2018, she appeared on the cover of The Hollywood Reporter. 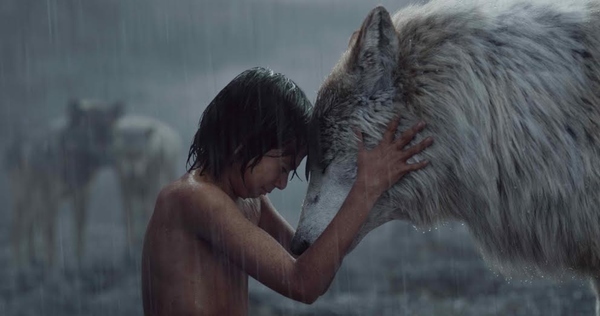 Lupita Nyong'o Lends Voice to Wolf, Raksha, in "The Jungle Book"